Shahbaz Qamar Fareedi’s talent came into the spotlight at an early age. He is the well-known Sanna Khawan who has always received first position in the Naat Khuwani competitions arranged in Pakistan. He owns the title of Bulbul-e-Pakistan (Voice of Pakistan). The style of Shahbaz Qamar for reciting Naats contains a bit different saga that involves a lot of body language, which gives more meaning to words. Shahbaz Qamar Naats cannot be compared with other Naat Khawan such as Owais Qadri and Yousaf Memon. 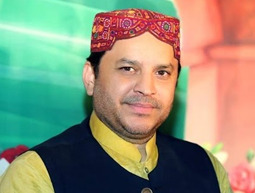 Shahbaz Qamar Fareedi said that his Ustaad (teachers) in the Naat Khuwani field are “Sher Ali and Mehr Ali” who are the great Qawwals of the Sub Continent. He acknowledges that he is inspired with the talent of Nusrat Fateh Ali Khan and implemented his style in his Naat Khuwani field. You can get a wide collection of latest Shahbaz Qamar Fareedi 2015 Naats available online on HamarWeb.com. You can listen and download Shahbaz Qamar Fareedi Video Naats on our website. Visit us for listening and witnessing the Shahbaz Qamar Fareedi Naats 2015 best audio and video quality anytime anywhere and remark us with your feedback.